The string that uniquely identifies this peptide (or peptides) linked at these specific positions (if any), with the given positions and respective masses of modifications (if any). 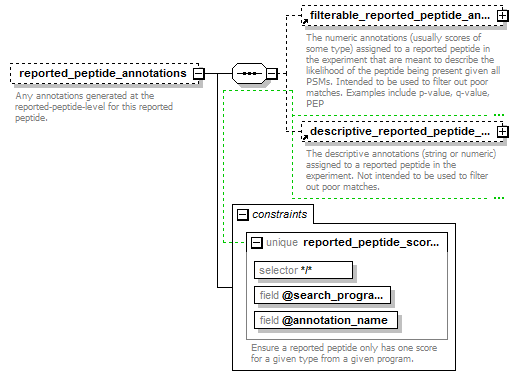 See the annotation of "reported_peptides" for more details. The type of reported peptide, either "crosslink" for two peptides linked by a crosslinker, "looplink" for a single peptide connected by two ends of a crosslinker, or "unlinked" for peptides that are neither of these. A peptide from a peptide spectrum match, may be unlinked, looplinked, or a crosslinked pair of peptides. 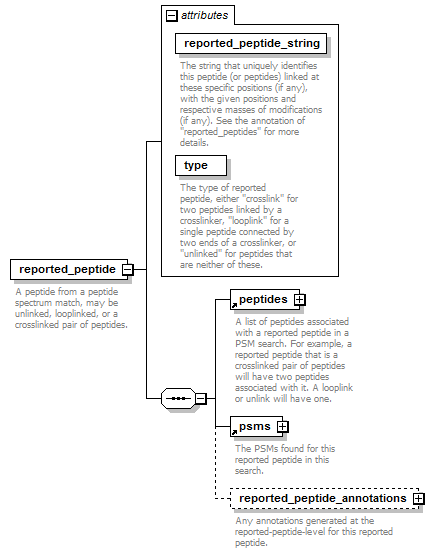 Ensure a reported peptide only has one score for a given type from a given program. Any annotations generated at the reported-peptide-level for this reported peptide.